Like most backcountry skiers, nights spent in ski huts are among my most cherished mountain memories. Sleeping in a snow cave might put hair on your chest, but after a long day in the mountains, the basic comforts provided by a mountain hut can seem like the Ritz-Carleton penthouse. 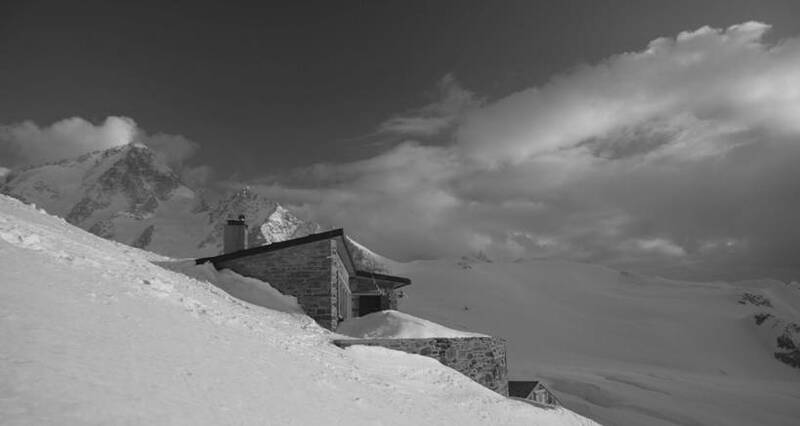 Uniquely social places in the midst of barren alpine wilderness, a hut’s forced proximity and the shared excitement of a day’s skiing melts away the awkward social interactions of “down there,” making kindred spirits out of complete strangers. And when things go awry, the safety net provided by mountain refuges can make all the difference. The other night I went to a fundraiser for the Spearhead Huts committee. The initiative began as a memorial for a couple of avid backcountry skiers who tragically passed away while skiing a few years ago. 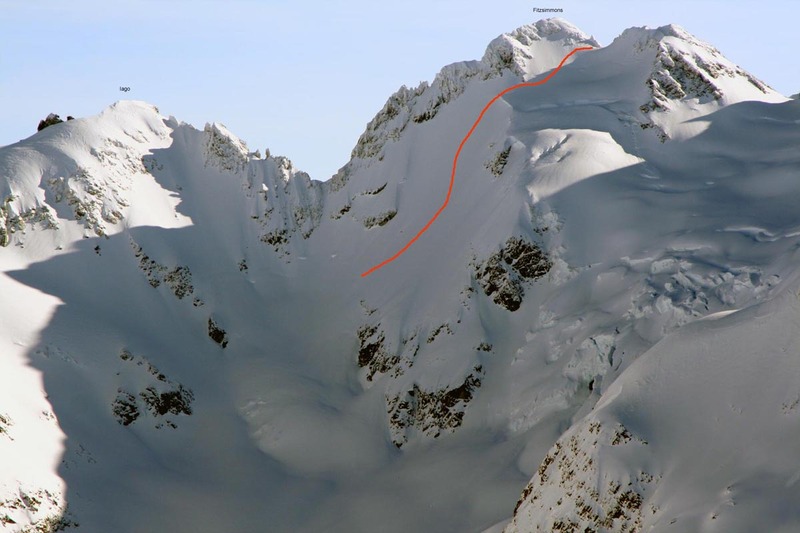 Essentially, the plan is to build 3 or 4 backcountry huts throughout the Spearhead Traverse, the 40-kilometre long horseshoe of high alpine terrain that links Whistler and Blackcomb Mountains. ﻿﻿There are already several backcountry huts scattered throughout the Coast Mountains, including the Himmelsbach hut near the Whistler end of the Spearhead Traverse. This new project, however, would create the region’s first multi-day hut-to-hut traverse like those which exist in the Rockies and the Alps; the Haute Route between Chamonix, France and Zermatt, Switzerland being the most renowned. Hut-based traverses are a wonderfully “civilized” way of experiencing truly dramatic and remote landscapes, enabling skiers (and summer-time hikers) to cover large swaths of terrain without the added strain of carrying camping gear and 24-hour-a-day exposure to the elements. Dry clothes on day 3 are the height of luxury. While the traverse has been completed twice in a single day in a pretty astonishing feat of endurance, those more intent on taking in the scenery, or actually skiing, generally cover the route over two to four days. Some may complain that the construction of additional huts will increase traffic, and diminish the sort of “out there” wilderness experience that many backcountry enthusiasts seek, but really, what better location is there for the huts?The area is already some of the most heavily used backcountry terrain in the province, and the combination of relatively mellow glaciers surrounded by dramatic peaks is perfectly suited for hut-based touring. The environmental impact of the project mught even end up as a positive, as there are currently no overnight camping facilities aside from the Himmelsbach hut outhouse, and the huts would concentrate campers into three or four specific sites. 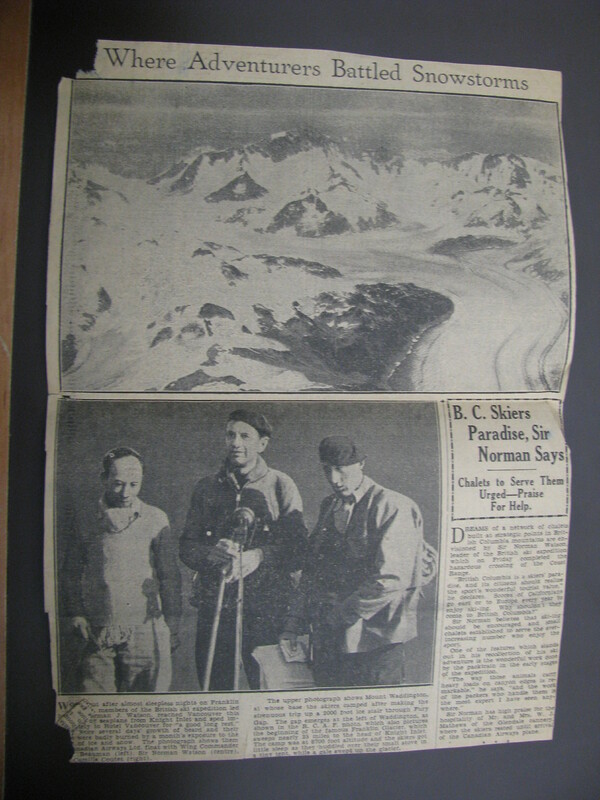 A 1934 Vancouver Province article following the first successful ski traverse of the Waddington Range. The adventurer's returned to Vancouver raving about B.C. 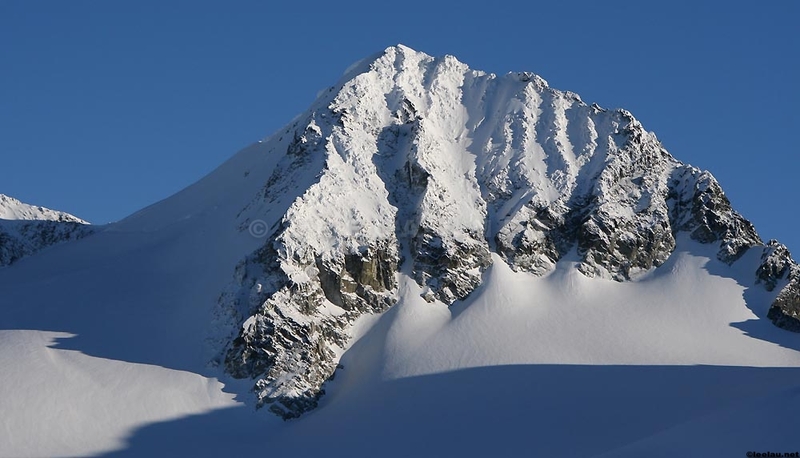 as a "skier's paradise," advocating the creation of a system of backcountry ski huts to improve access to and recreational opportunities in the Coast Mountain wilderness. At the fundraiser the other night the BCMC reps had a large map of the Spearhead on display which showed potential hut sites. I can’t find this online yet, but when I do, I’ll post a link. So far, the region has been divided into 4 zones, with 3 or 4 huts to be built throughout the zones. I, for one, hope they keep the Himmelsbach hut, or even upgrade the spartan refuge with some insulation and a basic woodstove. It’s in a perfect location beside Russett Lake and at the base of Fissile Mountain’s amazing Northwest Face ski runs. Also, in zone 1 (from the Blackcomb backcountry to Mount Pattison), the three potential sites are Decker flats, the east side of Decker Mountain, and the Trorey-Pattison col. I was told that the first option is being considered because it is more accessible for summer hikers, but really hope they opt for one of the latter sites. Decker flats can easily be reached in an hour from Blackcomb’s ski lifts, and putting a backcountry hut this close to the ski area would further blur the distinction between in-bounds and out-of-bounds terrain that is already largely ignored in the area. The last thing we need is more unprepared people heading out into this unpatrolled, avalanche-prone terrain because they heard there’s a hut back there. Also, I spent a night in a snow cave at the Trorey-Pattison col a few winters back and it’s a pretty spectacular spot,with full peak-to valley views of Wedge Mountain on one side, and Fissile mountain on the other. If they built a hut there, I’d want to move in full-time. What excites me most about the project is how much more accessible it will make the prize descents of the range. Classic steep descents such as the north faces of Fitzsimmons, Iago, and Tremor, used to entail either a big approach, a big pack, or both. When the huts go in, you’ll be able to ski them and countless others with a day pack and only a modest approach. Awesome. I just found this on-line reader for Mountain Life Magazine. Check it out to see the images and page layout for my “Ancient Alpinists” article (page 88-89), and make sure to browse the rest of the mag’s excellent content as well. I was a resident of Whistler in the 80’s to early 90’s. I always wanted to do the spearhead traverse but was never experienced enough. This is now on my bucket list. I’ve skiied some of the glaciers behind blackcomb when a friend took me up in his jet ranger. Heard of Ziggy’s bowl, Peter Z was our guide those days. (former head of Blackcomb patrol) Those were the days! Hey Ian, thanks for the comment. The Spearhead is highly recommended. It’s doubtful any of the huts will be complete before 2025, so if you want to experience it in its current, more “primitive” state, the window is still open!